Lightspeed was founded on the core idea that all science fiction is real science fiction and that science fiction is vast. It is inclusive. Science fiction is about people, and queer people, no matter how they identify, are a big part of that. They always have been. They're just sometimes harder to see. 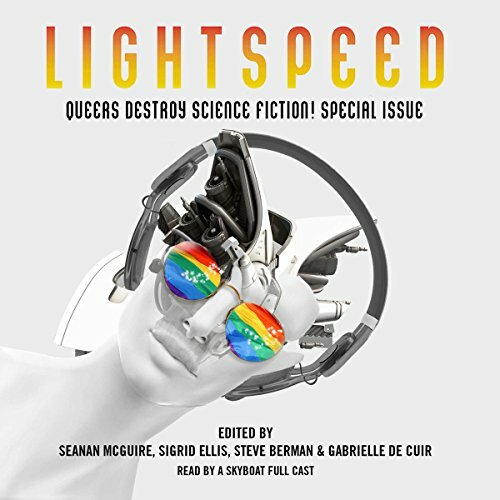 So, in the interests of visibility, Queers Destroy Science Fiction! shows just how wide the spectrum of sexuality and gender identity can really be. This special issue features original science fiction short stories from John Chu, Kate M. Galey, Bonnie Jo Stufflebeam, Chaz Brenchley, Felicia Davin, Rose Lemberg, Jessica Yang, K. M. Szpara, Amal El-Mohtar, Tim Susman, and Susan Jane Bigelow. Plus, it includes original flash fiction from E. Saxey, Charles Payseur, Claudine Griggs, Stephen Cox, Eliza Gauger, Erica L. Satifka, Gabrielle Friesen, Gabby Reed, Shannon Peavey, Sarah Pinsker, Bogi Takács, and JY Yang, as well as reprints by RJ Edwards, AMJ Hudson, Raven Kaldera, Rand B. Lee, and Geoff Ryman. Full list of narrators includes John Lee.